When all of your vehicle's wheels are lined up exactly with each other, your wheels are in alignment. 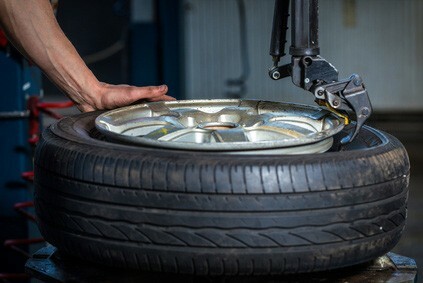 Hitting a road hazard in Kelowna or even just the normal bumps and bounces of everyday driving in BC can cause your wheels to be out of alignment. This can lead to premature tire and suspension wear. The first angle is called toe: do the wheels point in towards each other or away from each other at the front of the tire. The next angle is called camber: do the wheels tip in or out at the top. The ideal alignment for your vehicle was designed by its engineers. Alignment service in Kelowna at EUROPRO AUTOHAUS starts with an inspection of the steering and suspension – so see if anything's bent, broken or worn out. Then the friendly and knowledgeable EUROPRO AUTOHAUS technician will look at tire condition. From there, the vehicle is put on an alignment rack and an initial alignment reading is taken. The wheels are then aligned to 's specifications. Your vehicle's owner's manual probably has a recommendation for how often your alignment should be checked – usually every couple of years. If you suspect an alignment problem, get it checked at EUROPRO AUTOHAUS in Kelowna before you suffer tire or suspension damage. When Kelowna residents take a corner in their car, the outside wheels have a slightly longer distance to go than the inside wheels. That means that the outside wheels have to turn a bit faster than the inside. The piece of mechanical wizardry that makes this possible for is called the differential. Because all the power of the engine is transferred through the various differentials, you can imagine that they are very strong and are built last a long time. That's why it's for Kelowna to keep their differential properly lubricated. Differential fluid cools and protects the gears. Your friendly and knowledgeable EUROPRO AUTOHAUS technician will check differential fluid level and top it off if necessary. With low fluid, the differential will run too hot and wear prematurely. Ask your service advisor at EUROPRO AUTOHAUS (250-870-8339) for when it's recommended to change your differential fluid. Fresh fluid will extend the life of your differential. Your will also inspect the u-joints which connect your drive shaft to the differential and may recommend service. Some u-joints can be lubricated as part of a routine EUROPRO AUTOHAUS lube, oil and filter change as well. 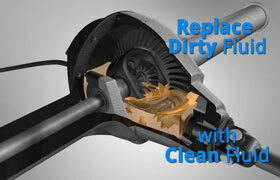 Kelowna residents need to know that differentials eventually wear out and need to be replaced. You might notice a strange noise from your axle area as one of the first warning signs. When the differential shows signs of failing, it's to repair it. BC residents who leave it too long run the risk of it freezing up when they're driving and could lose control of the vehicle and other parts like the axle, driveshaft and transmission could be damaged. Let's address a very important maintenance item for everyone in Kelowna BC – timing belt replacement. It's important because letting this one slide can lead to very expensive engine damage. Now, timing belts just wear out naturally so you want to replace a worn belt before it slips or breaks. Check your owner's manual or with your service advisor at EUROPRO AUTOHAUS in Kelowna BC to see when they recommend you replace the timing belt. If you've never replaced your timing belt and have 60,000 or more miles on the clock, talk with your Kelowna service advisor at EUROPRO AUTOHAUS right away to see if you're due. BMW & Mercedes Oil Change Special - $99.95! Taxes and disposal fee’s are extra. BONUS: All new customers will be entered into a draw for a Ipad Mini. Waiting at EUROPRO AUTOHAUS for your vehicle to be serviced is probably not your idea of a great time on the town. But we at least want it to be as pleasant and comfortable as possible for Kelowna auto owners. While you are here, avail yourself of the materials around the waiting area that help explain important automotive service and safety issues. We hope to be your go-to resource for vital auto care issues. If you have any concerns or questions, please feel free to talk to your EUROPRO AUTOHAUS service advisor. We’ll keep you posted on how your service is coming along and will clean up after ourselves when we return your auto. If you have any other needs while in our Kelowna facility, just ask. Today’s EUROPRO AUTOHAUS post focuses on the importance of protecting your mass air flow sensor or MAF. Air and fuel are mixed together to be burned in your engine. The amount is controlled by how hard you press on the accelerator or by external factors like climbing hills or hauling loads. Based on how much air you need – and how much is available – your engine management computer tells your fuel injection system how much fuel to send to your engine. But what if the computer is getting the wrong specifics about how much air is coming into your engine? Well, it would send the wrong amount of fuel and your engine performance would suffer. The Mass Air Flow (MAF) sensor measures the volume, temperature, and density of the air flowing into your engine. With that critical information, the computer calculates how much oxygen is available to burn and adjusts the amount of fuel it sends. A dirty or damaged MAF sensor can give the wrong readings, hurt your fuel economy, damage the catalytic converter, reduce engine performance, trigger the Check Engine Light, and, worst case, stop your engine. Remember that you can drive your car if the Check Engine Light is on – unless it’s flashing. If your CEL indicates a MAF problem, EUROPRO AUTOHAUS recommends that you take action before you damage your catalytic converter. How does an MAF sensor get damaged? Well, let’s look at this process again. As air comes into your engine, it first passes through the engine air filter. Dust, road grime, pollen, and other detrimental contaminants are, hopefully, trapped in the filter. If the engine air filter becomes clogged, some of the pollutants can pass through and hit the MAF sensor. Thus, a clean engine air filter protects your MAF sensor. Reason number 47 to replace your engine air filter as recommended. Your EUROPRO AUTOHAUS tech can quickly inspect your engine air filter to see if you need a new one. A caution: low-line air filters may actually contribute to MAF sensor failure as filter material can come loose and contaminate the sensitive sensor elements – filter material is just as harmful as outside gunk. When your thoughtful EUROPRO AUTOHAUS technician recommends you replace your engine air filter, examine how much is riding on that inexpensive but vital part. Wiper blades may not be the most exciting topic for most Kelowna motorists – but they are pretty important. Most of us Kelowna auto owners have had an experience when a sudden snow or rain storm hits while we’re driving; then when we turn on the wipers – nothing but streaks. This can be especially disconcerting at night when the glare of on-coming headlights distorts your vision. Simple answer: change your wiper blades BEFORE they fail. Check them out every couple of months just to see how they are working. Of course, the more you use your wipers, the sooner they’ll wear out. Kelowna car owners with lots of storms or those who drive a lot in BC where there are bugs and road grime will use their blades more. But even when you’re not using your blades, they are exposed to sunlight, ozone, soap, and extreme hot and cold BC temperatures which lead to deterioration. Your blades can just rot away and fall apart before you need them. Of course, using your wipers when the blades are torn can lead to scratches in your windshield. Kelowna car owners don’t want to risk a costly windshield replacement over the cost of a couple of wiper blades. Now let’s talk about wiper blade upgrades. 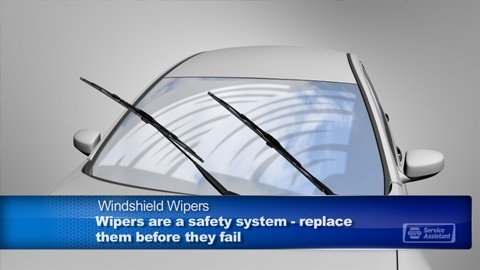 Kelowna car owners can upgrade both the design and the wiper material. Let’s start with the material. Traditional black rubber blades do a great job of clearing your windshield when they are new. Over time all of the conditions mentioned above damage them and degrade their performance. Silicone blades are far less affected by environmental conditions and will simply perform better for a longer time for Kelowna car owners. So which blade should you settle upon? Well always use at least the grade and design that came with the vehicle from the auto maker. Upgrade for better performance and longer lasting blades. The extra cost of premium blades is a good value for this important safety system. While you’re at it, make sure you have plenty of windshield washer solvent (use a winter formulation when Kelowna temps drop below freezing) and that your washer nozzles are working well. Talk with your thoughtful EUROPRO AUTOHAUS service specialist about upgrading your wiper blades. 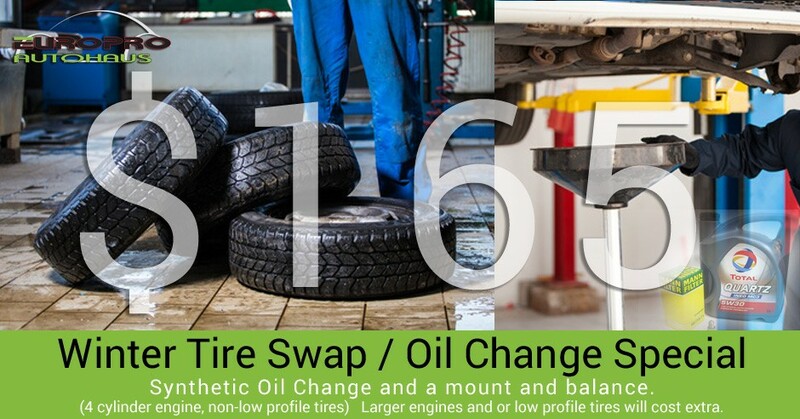 Get a Winter Tire Swap and a Synthetic Oil Change on your Diesel or Gasoline car for $165! What can I do to Improve Fuel Economy? There are actually a lot of things Kelowna car owners can do – some of them are pretty easy. One of the first things Kelowna car owners should do is make sure their tires are properly inflated. On the inside of the driver’s door or door jamb is a plate that indicates the correct tire pressure. Careful – there might be a different pressure for the front and rear tires. Check them at least once a month. Carrying extra weight in the vehicle hurts gas mileage. Leave unnecessary stuff home. Do we even need to mention driving fast around Kelowna and jackrabbit starts? Gently accelerate and plan your stops so that you can ease into them a bit. This really makes a big difference. Now there are a number of essential maintenance items that improve fuel economy for quick Kelowna drivers. Lubricants should be replaced on schedule – dirty oil, transmission fluid and differential fluid cause more friction and drag which hurt fuel efficiency. A big one is having a fuel system cleaning done if needed. A dirty fuel system can really reduce engine efficiency and increase fuel consumption. And if your Check Engine Light is on, take your sedan in to EUROPRO AUTOHAUS in Kelowna for a diagnosis. Some conditions that trigger the light can really hurt your fuel economy. Getting the necessary work done to correct the fault will help your engine run better and may bump up your mileage. And watch out for miracle cures. There are a lot of products being sold in BC that claim to increase fuel economy. Check them out before you buy. Ask your thoughtful EUROPRO AUTOHAUS service advisor for ideas to improve your sedan’s fuel efficiency. Your serpentine belt drives your alternator and air conditioning compressor. The power steering and power brake pumps are driven by the serpentine belt in many sedans. 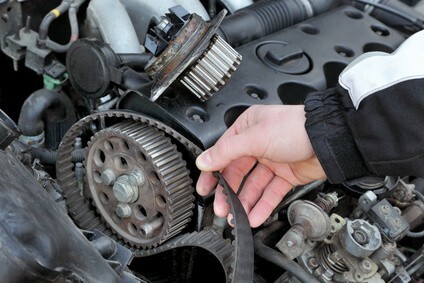 In some vehicles, the water pump is driven by the serpentine belt (in others it’s driven by the timing belt). The radiator cooling fan on some sedans are also driven by the serpentine belt. Some have separate electric motors. Serpentine belts do a lot of work for Kelowna drivers, but they’re tough and can last for thousands of kilometers, but just how long will they last? That’ll vary for each individual sedan. Your vehicle manufacturer will have a recommendation for when it should be changed, but it could need it sooner. The good news is that a visual inspection at EUROPRO AUTOHAUS in Kelowna can reveal a belt that’s worn. It’s often recommended that the tensioner pulley that keeps the belt at the proper tension be replaced along with the serpentine belt. This pulley is mounted to the engine block with a spring loaded arm. What are the warning signs that there’s a problem with the serpentine belt? Kelowna auto owners may hear a squealing sound from under the hood when accelerating. A loose belt might give you a slow, slapping sound. If you suspect a problem with your serpentine belt, or if it’s just been a while since it was last checked, ask your thoughtful EUROPRO AUTOHAUS technician have it looked over. My car failed its emissions test – what do I need to do? Let’s get this out of the way: a leak in your exhaust system could be deadly. If Kelowna car owners smell exhaust in the passenger cabin or hear an unusual exhaust sound, they should get their exhaust system checked and repaired. Talk to your thoughtful EUROPRO AUTOHAUS service advisor This is essential: Carbon monoxide in your exhaust is odorless, colorless and tasteless can be fatal to you and your passengers so don’t delay if you suspect and exhaust leak. There could be a number of reasons for a failed BC emissions test so some critical diagnostic work is in order. 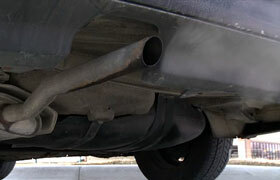 A common reason for Kelowna motorists is that the catalytic converter has failed. 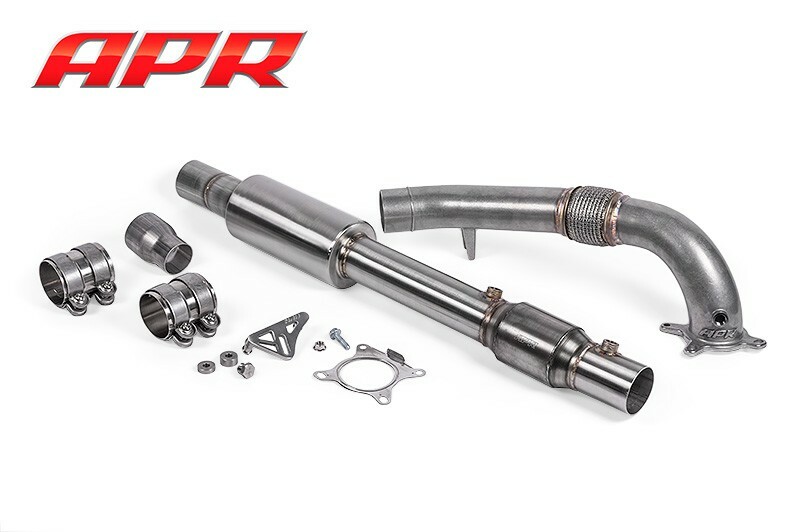 The catalytic converter removes some of the harmful elements in exhaust. When a catalytic converter fails it must be replaced, which isn’t cheap for Kelowna drivers. Many Kelowna folks stop there – but the converter failed for a reason. There may be any number of engine run conditions that led to the failure. It would certainly be smart to have your thoughtful EUROPRO AUTOHAUS service advisor diagnose the cause so that you don’t end up with another costly catalytic converter replacement down the road. Oh, and that Check Engine Light that so many Kelowna car owners ignore: It might just be illuminated for a an essential condition that could lead to catalytic converter damage. Have your EUROPRO AUTOHAUS service specialist get to the bottom of any check engine light situation. What is power brake service and why do Kelowna drivers need to have it done? Imagine: you pour a tablespoon of water in your hand and throw it as hard as you can. Now, suppose you pull a tablespoon of water into a syringe, push the plunger and squirt it out. Which would go further? Of course it’s the water squirting out of the syringe. That’s because you pressurized the water. Your power brake system is kind of the same thing. 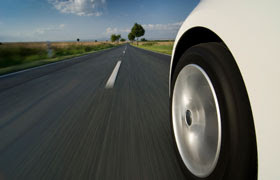 When you step on the brake pedal, the master cylinder pressurizes brake fluid which actuates the brakes so you can stop. Kelowna motorists who don’t have enough pressure – can’t stop. A leak in your brake system would curtail – or even eliminate – your stopping power. 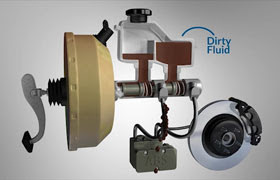 Brake fluid attracts moisture which can cause harmful leak-inducing corrosion. So a great way for Kelowna motorists to keep their brake fluid free of contaminants is to change it as recommended. Enough brake fluid is important for the proper function of Kelowna car owners anti-lock brakes, traction control and stability control systems. Your thoughtful EUROPRO AUTOHAUS tech will review your brake fluid level during a full-service oil change. If it’s low it may indicate that a thorough brake inspection is vital. Low brake fluid is most commonly caused by worn brake pads. Some of the signs of a leak are reduced stopping power and spongy or hard pedal feel. If you suspect a problem, come into EUROPRO AUTOHAUS for a brake inspection right away. Our car’s so essential to our lives in BC: when it breaks down, Kelowna drivers need it back on the road as soon as possible – with the problem fixed right the first time. If you’ve ever checked into some of the training EUROPRO AUTOHAUS technicians receive, you may be surprised at how much knowledge and skill goes into diagnosing and repairing a modern car in Kelowna. Our engines are more and more powerful, fuel efficient and reliable. This is all due to engineering. But the critical advances come at the price of simplicity. Modern cars are so much more complex from a mechanical and electronics standpoint that it can make Kelowna drivers' heads spin. Vehicles have several networked computers controlling most of the engine functions and many other vehicle functions as well. Kelowna auto owners take all of this essential sophistication for granted – but somebody has to fix it when it breaks. It requires a high level of commitment on the part of your thoughtful service specialist and EUROPRO AUTOHAUS as well. In addition to the auto mechanic training, there’s the financial commitment to purchase the expensive diagnostic and repair tools. The ability to repair your vehicle requires a strong combination of training and resources at EUROPRO AUTOHAUS in Kelowna. So try to relax next time you take your sedan in to EUROPRO AUTOHAUS. You’re in good hands. What is a differential and why do Kelowna car owners need to have it serviced? First of all – your vehicle does have a differential. If it’s a rear wheel drive, your differential is on the back. If it’s front wheel drive, your differential is built into your transaxle (transmission). Kelowna drivers with all wheel drive or four wheel drive will have differentials front and rear and maybe one in between. When you are steering through a turn at an intersection in Kelowna, the wheels on the outside of the sedan have to spin faster than the inside wheels because they have to travel a slightly longer distant through the curve. The differential compensates for these speed differences between the wheels. Because it is part of the important equipment that transfers engine power to the wheels, the differential is working pretty hard. Differential fluid – a special heavy-duty oil – cools, lubricates and protects the differential. It needs to be replaced on a schedule to remove metal shavings and other contaminants. Note: if you have a front wheel drive vehicle, replacing your transmission fluid takes care of your differential service needs. Differentials have become increasingly sophisticated for Kelowna drivers. Rather than the simple mechanical devices of yesteryear, they are more complicated and may actually be part of the important computer controlled sedan stability system. This means they are more pricey so it pays for Kelowna drivers to have them serviced on schedule at EUROPRO AUTOHAUS in Kelowna to avoid premature wear. Talk to your thoughtful EUROPRO AUTOHAUS tech. At EUROPRO AUTOHAUS, we provide quality automotive service including air conditioning service, battery service and windshield wipers. The air inside your vehicle may actually be more polluted than the air outside. Pollen, mold, dust, etc. can be trapped inside your vehicle. The cabin air filter stops these pollutants before they even get inside and filters out odors and smoke. People who suffer from seasonal allergies really appreciate a clean cabin air filter. At EUROPRO AUTOHAUS in Kelowna we install quality replacement parts. Give us a call at 250-870-8339 and let us help keep you safely and economically on the road. 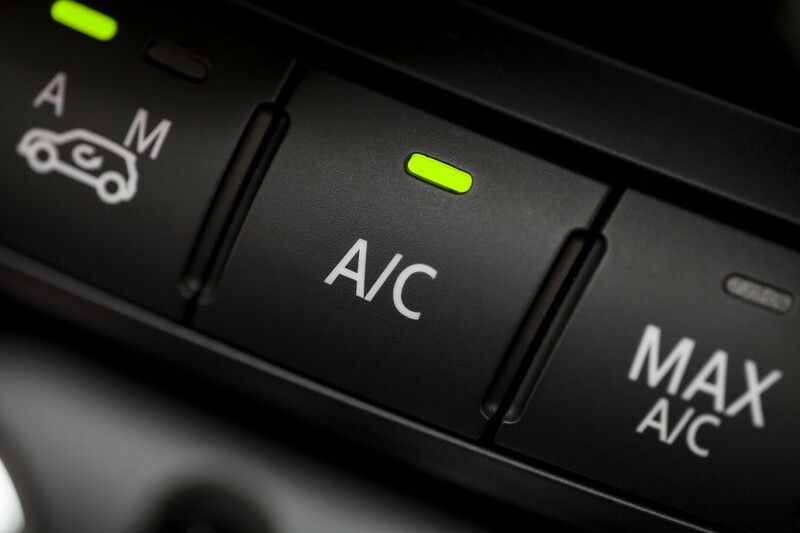 The heat is rising so beat the rush and have yor AC tuned up and keep cool in the hot Okanagan sun! For $168 plus the cost of refridgerant. Price includes all labour to recharge your air conditioning system, air conditioning dye, air conditioning oil, and refrigerant stop leak. It is that time of year again! Spring has come early in the Okanagan so we are offering up a Tire Swap Special. Don't wear down those winters. Swap to your summers or all-seasons and now save. We are offereing a tire swap over, mounting and balancing for only $65. Low profile tires may cost a little extra depending on tire, rim and profile. 80mm inlet with integrated o2 bung and flange. Also available for AWD 2.0T, FWD 1.8T/2.0T Gen 3! Check out APR for more details on the tunes available for your car.